ATM+ is a revolutionary approach to enhance the strength and conditioning of your body for better functional movement. Improved functional movement means improved quality of life. This new program is developed jointly with Tom Rankin, a strength and conditioning coach in Stanford University and Simon Wong, a Personal Trainer. ATM+Core Strength is focused on developing your core strength which is essential for all manner of movements and sports. With a strong core, there is a significant reduction in injuries during functional movements. In addition, it enhances vitality and wellbeing. Come and experience the distinctive powerful Awareness Through Movement (ATM) learning and core strength enhancement. You will be enlightened to know it is “all gain and no pain”. Awareness Through Movement (ATM) is a learning system that benefits everyone, whether you have special challenges, seek continued well-being, want to maintain peak performance, or are interested in making the most of yourself in thought and action. ATM is the exploration of the connection between the brain and behaviour. The brain – behaviour connection is one of the keys to realizing our full human potential. It enables reprogramming of the nervous system through patterns of thought and movement, bringing forth the fullest expression of abilities. What happens in an ATM lesson? ATM Classes are run in a group format and students are guided step-by-step through a sequence of gentle, physical movements alternating with periods of quiet rest. 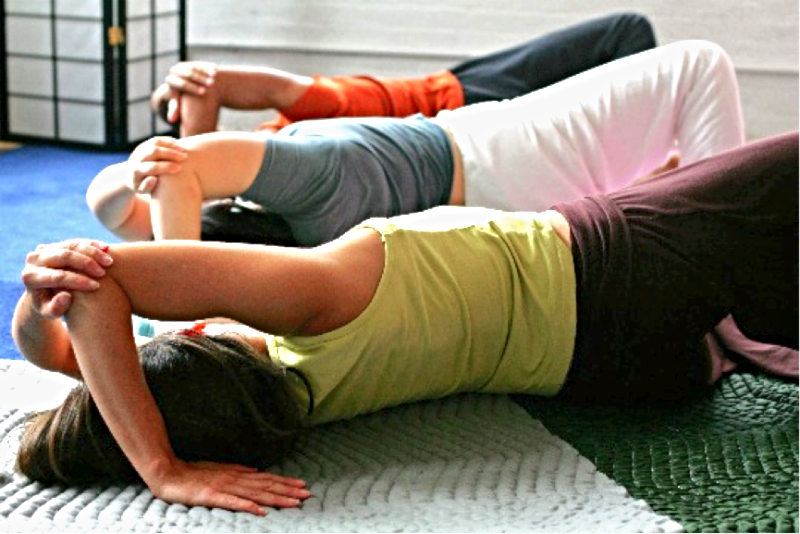 The classes are done while lying on a soft mat on the floor, standing, walking or sitting. The rest periods between the movements in ATM are as important as the movements themselves. It allows the body to assimilate the movement and effortlessly promote effective learning. Each class is carefully structured to reveal something new and fascinating about yourself. ATM helps to gain greater self-awareness and more options for action. The effectiveness of this work has been established through countless cases demonstrated through a century of work, first by Dr Moshe Feldenkrais, furthered by MBS Academy’s founders – Mia Segal and Leora Gaster, shared by MBS Academy Trainers, and continued by the many MBS practitioners. Whether you are a teacher of a movement modality, or a student wishing to enhance your own movement performance, how you think of movement makes all the difference. Through ATM you will find direct lines of connection between your thinking patterns and movement patterns, which will awaken your ability to use your powers for optimal learning and performance, and enrich your practice. Khaw Sa Chien, MBS Certified Practioner, learnt the MBS Feldenkrais Methodology directly from Mia Segal and Leora Gaster, both master trainers who studied and taught with Dr. Moshe Feldenkrais. Sa Chien has been practising bodywork therapy for more than 30 years. She uses Massotherapy, Myofascial therapy and the MBS Feldenkrais Methodology relieve pain and aid recovery from injuries. Her has successfully helped clients who suffered from stroke, Parkinson’s disease and sclerosis. She finds great joy and fulfilment when her clients walk away pain free with improved functional mobility. Simon Wong, MBS Certified Practioner, studied with Mia Segal and Leora Gaster to learn the Feldenkrais methodology. Simon is also an active corporate and NLP trainer/coach who has been teaching NLP certification courses for about 10 years. He integrates these modalities to explore the boundaries of higher performance in the world of sports, executive and personal development. Our hips carry the most weight in our body as we move about in our daily work and exercises. This workshop will help you to discover how your hips function in movement. You will also explore the way your hips relate to other parts of your body as a pattern. These patterns of movements are largely unconscious until pain brings focus into it. Happy hips lead to ease of movement and improved functional performance. Be it daily work, sports or artistic performances. During the workshop, the instructor will take you through in a series of gentle and conscious ‘non-functional’ movements that will lead to awareness of patterns. This awareness will then be generalise into daily functional movement. Please select the payment option below to secure your spot. Please contact Simon.Wong@GalleryHelios.com for enquiries. Simon Wong and Khaw Sa Chien are both MBS (www.mbsacademy.org) certified practitioner. They have been delivering Awareness Through Movement (ATM) classes for three years now in Singapore. They also offer FI (Functional Integration), a one on one therapy session. ATM class is the exploration of the connection between brain and behaviour as the key to realizing our full human potential. It enables reprogramming of the nervous system through patterns of thought and movement, bringing forth the fullest expression of abilities. Awareness Through Movement (ATM) is a learning system that benefits every one of all ages – whether you have special challenges, seek continued well-being, want to maintain peak performance, or are interested in making the most of yourself in thought and action.